I recently watched part of a CBC documentary, The End of the Line, about the catastrophic collapse of global fish populations—due to our insatiable appetite for seafood. It’s based on Charles Clover’s 2008 book, The End of the Line: How Overfishing is Changing the World and What We Eat. Once plentiful, Atlantic cod and Bluefin tuna are facing extinction. If we continue fishing at our current rate, most seafood will be gone by 2048. Fish farming is no solution for top-level carnivores like salmon because their diet requires killing huge quantities of small fish, such as anchovies; in other words, fish farming is only fish “conversion,” with no increase in total production. Once eaten mainly in coastal communities, fish is now trendy worldwide. No longer a delicacy or an oddity, sushi is popular with the masses. Once affordable only by the wealthy, shark’s-fin soup is now eaten by millions of middle-class Chinese any day of the week. On TV, celebrity chefs rave about fish and make home preparation doable for the masses; the documentary featured a clip of Jamie Oliver with a flawless slab of tuna, breathtakingly red and succulent. Laws limiting catch are hard to enforce and many governments don’t even try. (One place that does patrol its waters is Alaska.) Some fishers voluntarily limit their catch, hoping to ensure long-term stocks rather than immediate profit. But many do not. It’s really up to consumers to eat wisely. Googling “sustainable fish” will find numerous handy sites, such as the Monterey Bay Aquarium’s seafood recommendations for the USA and around the world. For three years during my 20s, I went vegetarian, partly for health benefits, partly to avoid the large-scale livestock industry. It wasn’t a huge transition, as I’d already reduced my consumption of fish, poultry, and especially meat since college. In a way, it simplified my life. At restaurants, having few options can be either liberating or limited, depending on your personality and perspective; for me (snap decisions are not my forte), a minimal menu was a time saver. I missed only sashimi and sushi. Eventually, when I found ProteinPromo’s list of deals and offers however, I added fish and meat back to my diet. I wanted an efficient protein source. With no carbs and ample omega-3 fatty acids, fish is outstanding. Second, I felt that my attitude was growing too rigid. Dining with friends during that period, I ordered the summer-roasted-vegetable risotto. I forgot to ask about the base (sneaky chicken stock) until way too late. It really damped my evening, despite my having eaten lots of chicken as a kid, and I decided to prevent further OCD tendencies. Applying the concept of ahimsa, nonviolence, to eating fish encompasses both the micro level (killing an individual fish) and the macro level (decimating the world’s oceans). I’m more concerned with the latter. The thought of empty oceans is quite staggering. Many “environmentalists” who protest harm to polar bears and white tigers have no qualms downing a plate of just-as-endangered Chilean seabass. Chefs are concerned primarily with culinary quality or popular demand. Medical professionals encourage eating fish over meat for cardiovascular health, but warn only of mercury contamination. My choice: I can limit my fish eating to “green light” species. Or I can again forgo the sashimi. I’m still deciding. That seemed to make sense to them. Have you seen the film, The Cove? I read about The Cove with interest, ended up missing its run in my town, and now plan to catch it on DVD. Having read your comment, I’m trying to imagine if I could kill a fish. (I already know that I couldn’t kill a chicken, pig, or cow, none which I eat anyway.) My gut feeling is no. 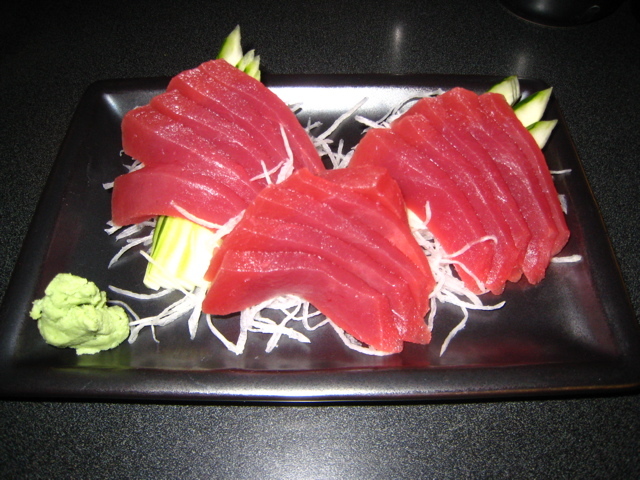 So, if I follow your rationale, I would be compelled to refuse the sashimi… An exception: starvation. I could kill a fish to save my life (and the lives of loved ones). What about creepy crawlies? Do you avoid killing any living being? If we’re talking about intentional killing, yes, I’m sorry to admit that I do kill certain insects in my home… I’m hoping the discomfort will eventually force me to find some other means of ridding myself of them, but it’s still the easier choice right now. And I think that’s really what it’s about. When it was easier for me to be a pescetarian or a special occasion meat eater, I was, because it was easier to get along, to not appear rude or political or preachy or ungrateful, to not make people uncomfortable, basically. Now, it’s easier for me to not eat flesh of any kind. That’s become the easy choice. And that was triggered, not by my rational mind, but by my emotional reaction to a video I saw about 3 years ago. The content bypassed all intellectual faculties and went straight for the core — you know that level of knowing that’s like the flicking of a switch? Suddenly, you know and can never not know again. And then, what follows is easy… no thinking required. There’s no practical advice in all this, but plenty of sympathy with your struggle. you are preaching to the choir here, Spy…I go back and forth on this, too. I am thisclose to being vegan but still eat fish on occasion for the protein, Omegas, etc. I agree with you totally about the devastation of the oceans. I have a card from the Monterey (California) Aquarium about which fish are “OK” to eat. it is indeed a quandry. Sk, that’s pretty much my reasoning on what I’ll eat and what I won’t. I can’t bear to kill a chicken or goat or cow but I can fish. So eat fish. Yeah, it is quite a quandary. that is impossible. what about gardening and digging into the soil? Chogyam Trungpa had a phrase “idiot compassion.” Idiot compassion would be letting carpenter ants eat your house and letting it fall down around you! I totally agree. I was perhaps thinking about voluntary killing … like the way I whack spiders with my shoe because they give me the creeps! Yep= as the daughter of a lobster fisherman, I can most certainly relate with the issue. I’ve heard quite a bit about Tuna, and Salmon, and well- obviously lobster. no way- those fish were not caught in the St Laurent River… so why would I want to eat them? Thanks for the very important and interesting discussion. But, I’m sorry, the highlight of your blog for me is the cover of “One Fish, Blue Fish, Red Fish, Blue Fish” which happens to be the very first book I read to my kids when they were little, starting a love affair with all the other Dr. Seuss books. Well, it is a difficult one for sure. There is no doubt in my mind that fish feel pain. So the concept of ahimsa goes right out the window if we eat any fish at all. Our family eats no meat at all anymore, and we TRY to be ethical when it comes to the fish we eat, but I must admit I am in Maui right now, and just had a Mahi-mahi fish taco without researching the environmental implications. How about those Omega 3/6 fish oils we consume? Where do those fish come from? I just read an interesting article on that in the Ny times. Then, are those oils packaged in gelatin or beef based capsules? One must be vigilant without being neurotic I suppose. Have you watched Sharkwater yet? That is an eye-opener. The hardcover book is amazing as well. This piece really hits home with me. I’m a fairly new vegetarian (within the last 4 months) who doesn’t (for now) eat dairy or eggs or (so far) fish. What’s the problem? I *am* a fisherman, and until I discovered yoga, fly fishing was my spiritual practice (don’t knock it ’til you’ve tried it). I’m really wrestling with the ethical implications of my favorite hobby and am finding myself able to make some pretty amazing rationalizations (i.e. how does my catching four fish a year stack up against all the chicks killed in the egg industry). I became a veggie after I was done fishing for a season, so I have the winter to work this out. Long story short…I *do* kill my own fish (maybe only one or two a year; mostly I catch and release and only keep a fish when camping), and I don’t know why I find that OK but not cows, chickens, or other creatures.